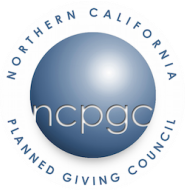 Northern California Planned Giving Council (NCPGC) respects and protects your privacy. NCPGC will never sell or rent your contact information to other individuals or companies. When you opt-in to our email list or register for an event you will receive emails for upcoming events and registration related emails. If you do not wish to hear from us, simply unsubscribe from any mailing or contact us directly. Links: This web site contains links to other sites. Please be aware that NCPGC is not responsible for the privacy practices of such other sites. To ensure your privacy, we encourage users to be aware when they leave our site and to read the privacy statements of each web site that collects personally identifiable information. This privacy statement applies solely to information collected by our (NCPGC) web site. Policy Changes: NCPGC periodically reviews and updates its policy for communicating with you via occasional email updates. We will post any updates about that policy on our website.